We've all faced some form of brokenness at some point in our life. Many of us still going through that brokenness. Often, just when we think time has healed our wounds, we find there are still cracks and the pain starts all over again. 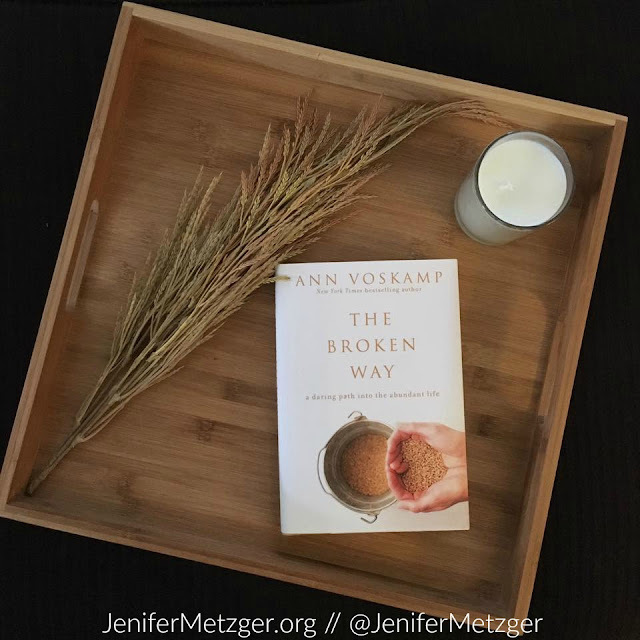 Ann Voskamp reminds us of a Biblical truth in her new book The Broken Way. She says , "There is the truth: Blessed -lucky- are those who cry. Blessed are those who are sad, who mourn, who feel the loss of what they love, because they will be held by the One who loves them. There is a strange aching happiness only the hurting know -for they shall be held." She also says, "Brokenness happens in the soul so the power of God can happen in the soul." Yes, we will feel broken. Our heart will ache and we may feel like we will never be able to go on. But God promises that He is close to the broken hearted. He promises to comfort us and to never, ever leave us. There is something so good, so sweet about this brokenness, when we turn to the Father. As always, Ann has a beautiful, poetic way with words that reach right into your heart and grab you as she encourages you. In The Broken Way you will be encouraged to see your brokenness as a way to get closer to God. Along with the book, in her six session study guide and dvd, Ann asks questions that you cannot afford to ignore. Questions like how did you live your one broken life? What does it mean to cruciform and learn to receive? And what do you do if you really want to know abundant wholeness -before it's too late? To enter to win The Broken Way book, study guide and dvd, complete each task in the rafflecopter below. This would be so helpful abd such a beautiful blessing right now with everything going on in my life and all that has happened. Broken times show me my utter dependency on Christ. I cannot do anything without Him.